Description of game: This game can accommodate any number of players, and can work as a team game. 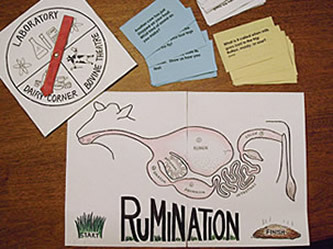 It gives lots of high-content information about rumination and dairy science, as well as a legitimate venue for being a little silly within proper limits (e.g. Bovine Theater). Time needed to play: If you are playing with a large group, it will take longer. Allow at least 45 minutes; an hour is better. Materials you will need: Copies of the pattern pages printed onto card stock, scissors, a very small lump of clay or play dough.